The Niijuku Ferry crossed the Nakagawa River on the Mito Highway. The local settlement on the Edo side was known as Kameari, and the ferry took its name from the larger and older town of Niijuku on the far side. There is some controversy as to whether Hiroshige has shown the ferry from Kameari (that is, the Edo side looking east) or from Niijuku. Ishii Kendo believed the view was from Niijuku, and Miyao Shigeo favored the Kameari side, where one would have found two restaurants (one on the right and one on the left, not visible here) that were famous for their carp. 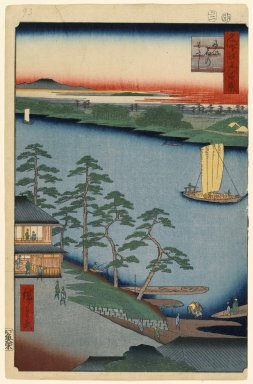 Shibui Kiyoshi said Hiroshige was following the "edo meisho zue" view, which seems to be the Kameari side. The author supports the Kameari side for the reasons that a cargo-laden boat seen here was more likely headed toward Edo than away from it. Also, Hiroshige had previously shown the Niijuku Ferry in volume VII of his "Ehon Edo Miyage" and the caption there makes it clear that it is from the Kameari side.